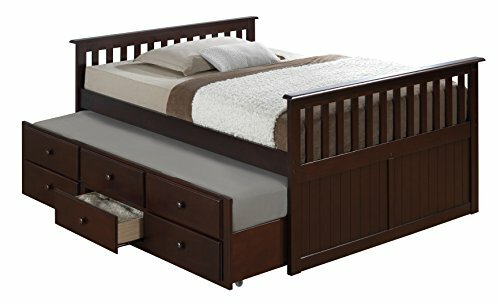 The Broyhill Kids Marco Island Full Captain’s Bed features a pull-out twin trundle bed with three functioning spacious drawers to bring style and functionality to any bedroom. Made from high-quality solid hardwood and composites, the Marco Island Full Captain’s Bed is sturdy and built for years of enjoyment. This bed is versatile as the included twin-size trundle bed has three functioning drawers, and the trundle can easily be wheeled in and out from under the bed to maximize space. You can rest easy knowing that this bed is safe as it is ASTM Certified and meets CPSC safety standards. Offered in multiple rich, non-toxic finishes, the Broyhill Kids Marco Island Full Captain’s Bed is the ultimate choice for any bedroom and is sure to last you for many years. Offered in multiple rich, non-toxic finishes, the Broyhill Kids Marco Island Captain's Bed is the ultimate choice for any bedroom as it fits any standard full-size or double mattress. If you have any questions about this product by Broyhill Kids, contact us by completing and submitting the form below. If you are looking for a specif part number, please include it with your message.